2013 has been a year of tremendous growth, exciting change, stronger partnerships, and a lot of learning coupled with fun about a product I really love. Nevertheless, 2014 holds exciting possibilities for the Avente Tile team. In the coming year, we'll be unveiling exciting new products - including our exclusive Signature Line. We're working to improve your shopping experience with better communication and simplify the shopping experience with clear and accurate information about our products, costs, and freight when you need it. The coming year will include some of the biggest and most exciting changes in our 12-year history! If you enjoy our blog - devoted to hand-painted and hand crafted tiles - make sure to follow our blog as told through pinterest and houzz. In this season of thanks and goodwill, the entire Avente Tile team sends our warmest regards and sincere thanks to our wonderful friends, loyal customers, and dedicated associates. We wish you all a happy, health and prosperous 2014. 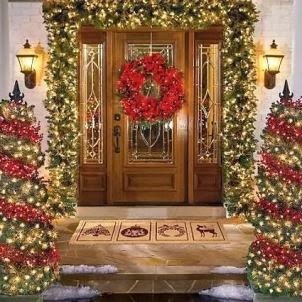 This home's entry is cheerfully decorated to welcome Christmas guests. As I get older, I realize how much faster time seems to be flying by when one day it’s Halloween, and the next it’s Christmas Eve! The cooking and baking are on full-speed, decorations are hung, and all we’re missing are the guests to make our home warmer with the sound of children running around, the shared laughter amongst friends and family, and of course, opening the treasure trove of carefully chosen and wrapped gifts. 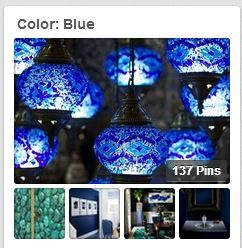 If you haven’t already joined, Pinterest has served us with great inspiration for holiday foods and decoration ideas. Christmas, a product of both secular and religious traditions, is one of the most celebrated holidays around the world. In our home, we've integrated many global Christmas elements over the years from opening English Crackers (not the kind you eat, but the kind you pop open), serving Buche de Noel, and of course, serving Anooshaboor (Armenian Christmas Pudding) to our guests. Combining elements from various cultures has become our tradition. Belgium: The children believe kindly Saint Nicholas will bring them their presents. They also believe he rides a horse so they leave him hay and carrots and water for his horse. Denmark: The Christmas feast is celebrated at midnight Christmas Eve. Everyone looks forward to dessert when a special rice pudding is served in which a single almond is hidden. Whoever finds the almond will have good luck for the coming year. France: In France, children place their shoes by the fireplace in hopes that le Pere Noel (Father Christmas) will place gifts for them. India: Houses are decorated with strings of mango leaves, lights are placed on the window sills and walls, and a star is hung outside. Iran: Iran, formerly Persia, is the land where the Three Wise men are believed to have lived when Jesus was born. Russia: In Russia, Babouschka brings the children gifts. Tradition says that she failed to give food and shelter to the three wise men, so she now searches the countryside for baby Jesus, visiting all children, and giving gifts as she goes. Spain: A traditional Christmas treat is turron, a kind of almond candy. What are your family traditions? I’d love to hear the different things you do or prepare for the holidays. From all of us at Avente Tile, we wish you and yours a very Merry Christmas. May the holiday season bring you the joy, warmth and fulfillment of being surrounded by family and friends, such as we are. For you, we are truly blessed and grateful! This month, Avente pays homage to the classic styles of Portuguese Tiles. 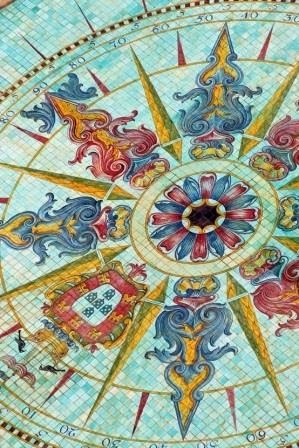 In last week's post, Arpi Nalbandian started the month-long celebration by introducing the rich history and culture of Portugal, and the important role hand-painted ceramic tile has played. Portugal is a great place for ceramic tile lovers like me – it’s used everywhere. 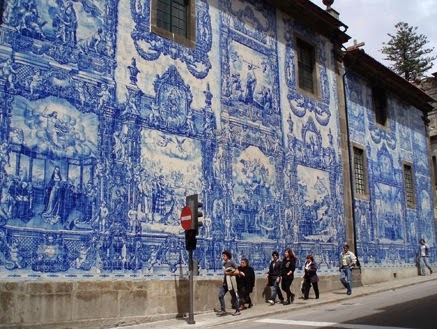 The Portuguese have been using tiles to decorate and protect interior and exterior walls since the 15th century. Every town and city has buildings with brightly patterned walls. 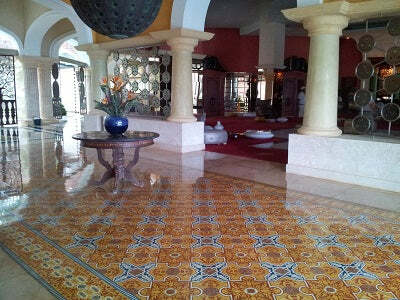 Today, I'd like to share my favorite residential installations using our line of Portuguese Tile. Nothing says Portuguese tile more than glossy tile with blue and white glazes. My first pick uses those striking blue and white colors – so evocative of Portuguese tile – and adds a touch of red and green with a stylized flower and stem. When this tile is used for the entire kitchen backsplash, the pattern creates eye-catching, decorative appeal and color. In keeping with the blue color scheme, Portuguese Oporto provides the perfect complement to the electric blue field tile on the countertop. Notice how the blues are not an exact match? The plain blue tile came from a different supplier; but, works well. With hand-painted tiles, you don’t need to find an exact glaze match to use with other tiles because their natural variation allows them to blend easily with colors of the same hue. Portuguese Oporto tiles provide decorative appeal and color in this kitchen backsplash. The same Oporto 6"x6" tile used for the backsplash, is also used on the bar. However, they framed the bar installation using the 3"x6" border tile and the same electric blue tile found on the counter. 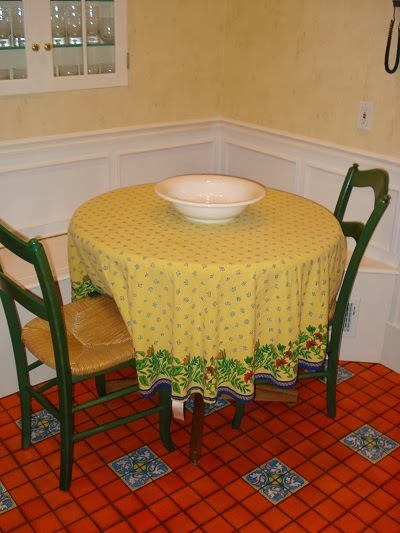 The 3"x6" liner has a top and bottom stripe of warm yellow that really sets them off from the main pattern. Avente's Portuguese tiled are hand-painted by an artisan tile maker and fired twice. The first firing sets the glaze. Then a second clear, over-glaze is applied to provide a glossy finish ideal for kitchens and baths. Easy to clean, safe and very sanitary. The Portuguese Braganza pattern is a classic pattern with an unusual color palette including pistachio green, azure blue, and terracotta against a bright yellow background. My favorite is the 6"x6" format when used on an entire wall. However, you'll see it more commonly used for stair risers, a pool sideboard, or outdoor patio liner. Our Portuguese tiles are great accent tiles for a floor or wall. Create medallions using four 3"x3" tiles and place randomly or in a pattern on the floor. As accents, they work well with both large and small format tiles. The "terracotta stems" of the leaf pattern that radiate from the center really make the tile pop when they're used as an accent to our Arabesque Cement Tile Pavers or any of our Classic Rustic Pavers. Detailed view: A medallion of Portuguese Braganza 3"x3" tiles on terracotta. The smaller Braganza dots are available in both 2" and 1" square formats. If you want a less floral pattern, the Portuguese Ruan is stunning and a great choice for bath or kitchen. The deep, inky cobalt blue and gold accents provide a straight-forward color palette. The geometric Moorish influences make this pattern work well for a more sophisticated look. 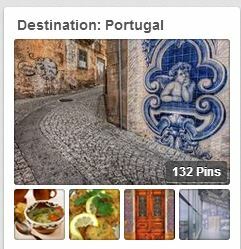 I hope today's post will inspire you to be a bit more like the Portuguese - start using tile just about everywhere. Three cheers for the Portuguese! Portugal is a land of Medieval castles, cobblestone villages, captivating cities and golden-sand beaches, history, great food and wine, and beautiful scenery. Aside from all these wonderful things are the ceramic tiles of the country. 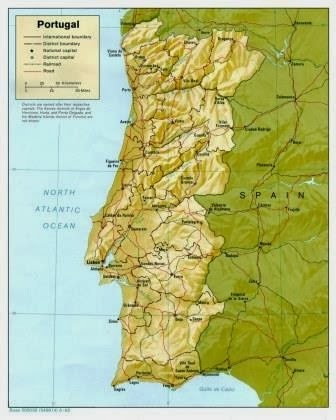 In Portugal, the tiles (or Azulejos in Portuguese) that cover the country’s buildings are a distinctive part of this land. These tiles come in a staggering array of shades (mostly of blue) and designs. Near the coast, everything is tiled. They’re distinctive as much for their individuality as for anything else, with whole blocks of buildings bursting with color, each façade different. Portuguese ceramic tile serves as a beautiful, functional and architectural element on structures and homes. Above image by Robert L. Peters. 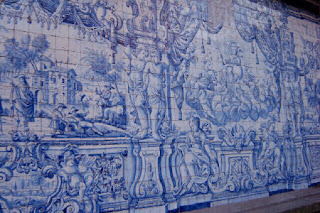 Portuguese wall mural image via The Read Headed Traveler. 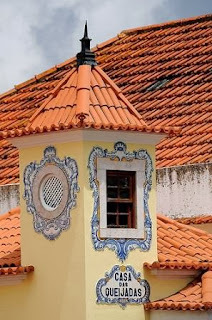 Portuguese ceramic tile adorn walls as architectural elements, as well as act as sign posts. Image via Candace Rose Arden. The terrace of the Four Seasons Hotel in Lisbon, Portugal, pays homage to the use of the country’s ceramic tile heritage. Image by Viktor Keech. The azulejos stem from a time when the Moors controlled the Iberian Peninsula. The patterns evolved from early designs, and the basic tin-glazing and shaping technique has changed little since. Brought to Portugal in the 1400s from Morocco and Algeria, the ceramic tiles are not only beautiful to look at, but also serve as a functional need in reflecting sunlight, trapping cold air, and keeping houses cool during the hot Portuguese summers. Additionally, these ceramic tiles help preserve the mortar and soft stone of Portuguese seaside houses by protecting them from the effects of moisture and salt. 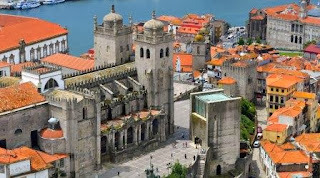 Overview of Porto’s Sé Cathedral. Image via Local Porto. 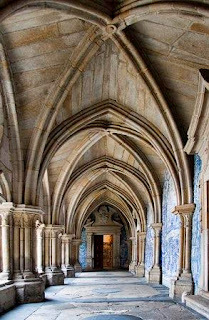 Portuguese ceramic tile adorns the cathedral's upper cloisters. Image via Nigel J. Ross. Cloister of Porto’s Cathedral. Image via Rota das Catedrais. 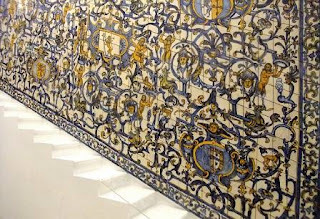 Historic Portuguese ceramic tile wall mural on display at the Museu Nacional do Azulejo's (National Tile Museum) in Lisboa, Portugal. Thankfully, efforts in preserving these historical ceramic tiles have become engrained in the day-to-day life of the Portuguese. 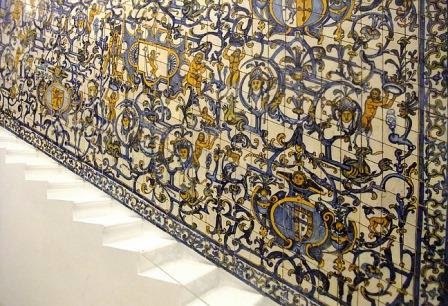 The Museu Nacional do Azulejo's (National Tile Museum), located in the ancient convent of Madre de Deus (Mother of God) in Lisboa, was founded in 1509 by Queen D. Leonor. According to its website, the museum’s mission “is the preservation, presentation and study of its collections and the building in which it is located regarding its safeguarding and enjoyment by present and future generations.” Portuguese ceramic tiles have lasted and become part of the language of the architecture. Houses are still built with the tile, and old buildings remain as vibrant as when they were first constructed. If you’d like to bring home a bit of Portuguese history, then take a look at Avente Tile’s collection of Portuguese ceramic tiles. Inspired by centuries-old styles from Portugal, these decorative ceramic tiles are hand painted on red bisque and finished with a high-gloss glaze. 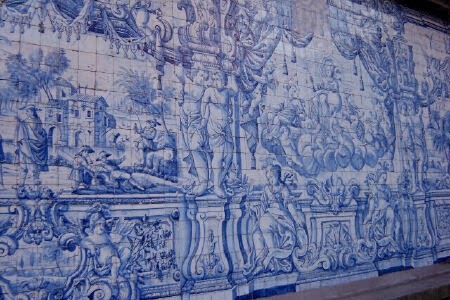 According to the curators of the Palácio Nacional de Sintra (National Palace of Sintra) in Portugal, the use of azulejos (a form of Portuguese or Spanish painted, tin-glazed, ceramic tile) in decoration is unique when compared with other countries by the way it adapts to architecture on a monumental scale. During the 15th century, the azulejos spread to the Iberian Peninsula and flourished together with other Mudéjar crafts. In that period, the azulejos used in Portugal came from Seville, the only supplier manufacturing center in the first half of the 16th century. Before that, and until the second half of the 15th century, only the alicatado (mosaic formed of polygonal, colored glazed tiles) was in use. Now, you too can bring the look and feel of Portugal into your home by using our Portuguese Ceramic Tiles in your next project. 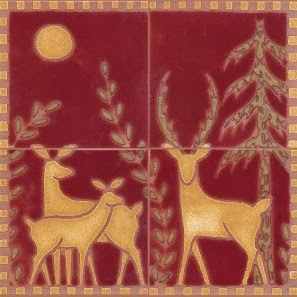 Inspired by centuries-old styles from Portugal, these decorative ceramic tiles are beautifully hand-painted on red bisque and finished with a high-gloss glaze. Crazing is normal, adding character and uniqueness to each tile. Each hand-painted design includes borders, corners, large decorative tiles and accent dots. The vibrant colors of our decorative Portuguese ceramic tile collection, such as this kitchen backsplash using our Oporto series, stands out when paired with our Portuguese Natural Ceramic Tiles. As always, our first priority is to offer excellent ceramic tile products backed by our expertise and customer service. 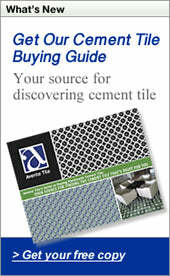 So, how can we help you with your ceramic tile needs today? Now that Thanksgiving is over, the frenzy of shopping and cooking for the winter holidays begins. Aside from feeling overwhelmed, these celebrations happily rejuvenate the feelings of warmth that only family and friends can offer. Throughout these holidays, the kitchen and main living spaces will be the most popular areas. With your guests undoubtedly chatting, eating, or lending you a hand, you'll want to keep things simple, organized and clean. When you choose one of our hand-painted Portuguese, Spanish, California, or Malibu ceramic tiles, complemented by our hand-painted ceramic field tiles, you'll definitely keep things simple because ceramic tile is not only easy to clean, it's also hypoallergenic, and inherently antimicrobial! Did we inspire you? Then visit our pages on houzz.com, our boards on Pinterest, and browse through dozens of our Ceramic Tile Design Ideas portfolio page where you can find a large collection of projects showcasing our handmade and hand-painted ceramic tile, cement tile, decorative tile, mosaic tile, and so much more. Let us know how we at Avente Tile can assist you!